Good news for serious gamers and CAD professionals seeking improved productivity and competitiveness! 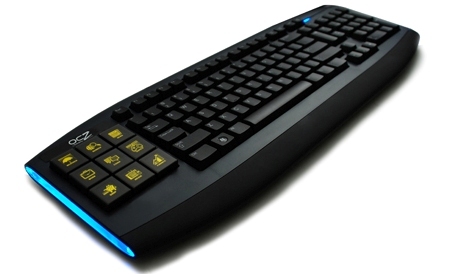 The world’s leading provider of ground-breaking, high performance memory and computer components that set industry standards, OCZ Technology Group has introduced its new highly-anticipated OCZ Sabre OLED multimedia keyboard, which the company claims as the world’s most intelligent gaming keyboard that combines user-friendly functions, durability and personalization features in a single device. The OCZ Sabre OLED gaming keyboard which measures 522 x 182 x 31-mm and weighs in at 2.7 lbs is compatible with Windows XP and Vista (32-bit) OS.